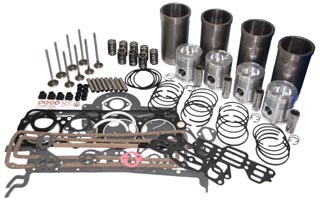 Complete engine overhaul kits contain: pistons, rings, wrist pins, sleeves, main bearings, rod bearings, engine gasket set, intake valves, exhaust valves, valve guides, valve springs, and valve keepers. Basic engine overhaul kits contain: pistons, rings, wrist pins, sleeves, main bearings, rod bearings, engine gasket set. Be sure to check bearing sizes carefully before ordering.